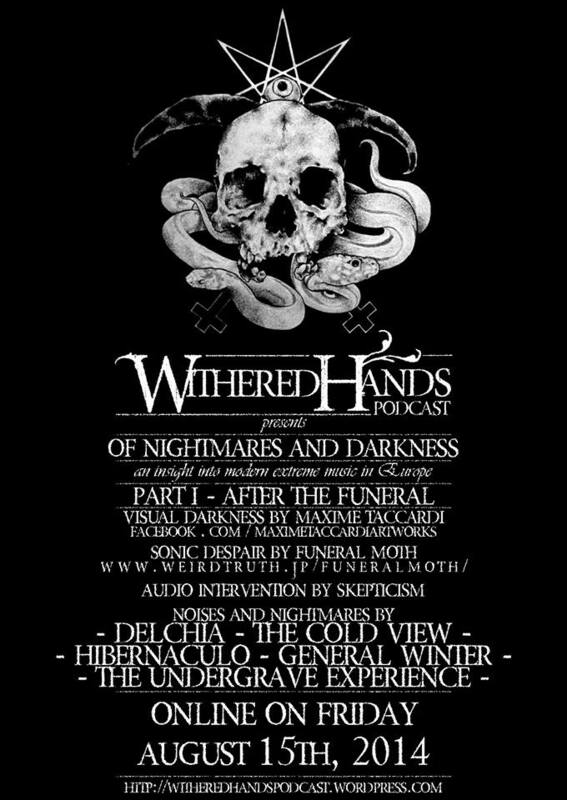 “Of Nightmares And Darkness” is a show in four episodes aiming to give an insight into modern extreme doom metal music in Europe. We tried to gather bands from each European country, bands of which music and sounds are a mix of funeral doom, drone metal, ambient, black metal and more. Bands who tried to converge in their style loads of different influences creating something somehow “new” in what is the typical music direction of most of the modern funeral doom metal bands. We decided to talk about an European scene where loads of known and unknown bands are creating some amazing music often without receiving enough support because too underground or far from the mainstream idea of funeral doom. We know there’re bands of this kind almost everywhere around the world but well, we wanted to start from somewhere closer to where we live, trying to find some points in common in their music and styles. This project is not just about those bands! During the show we play some other funeral doom metal bands and we try to find artists willing to give an image to rappresent the show and the main idea behind the show. We want to get the listener 200% into the show by getting him lost into it, feeling the nightmares and darkness we named the show after. On this first show, titled “After The Funeral” we try to find a way to talk about what happened in funeral doom and what it still happening in funeral doom where bands are trying to find new directions by mixing different music genres and styles with their funeral doom roots. MAXIME TACCARDI, who provided us with the image rappresenting this first show. Quoting his Fb profile: “My will and ambition is to create some sort of a Gesamtkunstwerk to quote Wagner, a total art with Synesthesia. My art consists of paintings, drawings but also short films, videos and music. It is not intended to shock people like some would think but is merely a process. The final result is as important as the way to do it, I see art as some sort of a ritual, a chat between spirits and my mortal flesh. I do recall on what philosopher Plato said about art which is the manifestation of spirits through artist bodies. Music, as a translation of my paintings into sounds is as important as my other practices. My project is named K.F.R which stands for kāfir (disbeliever in arabic), it is written on Dajjâl’s forehead, the Antichrist in Islam. To me it is the absolute sound description of my paintings, it joins Kandinsky idea about his will to translate music into paint. FUNERAL MOTH, the Japanese band who provided us with the background music you can hear during the whole show. Quoting their biography: ” In Autumn 2005, ex-Coffins/ex-Psycho To Black bass player Nobuyuki Sentou, ex-deathchurch drummer/de-nihil Makoto Fujishima, Morquido vocalist Jumpei Ishimaru gathered to create a new doom band. Our style is extremely slow and heavy doom. On 3rd May 2006 we played first gig with Stargazer(Aus), Intestine Baalism, Gallhammer, Intraum, Reexamine, and Morquido. In November 2006, we recorded first demo tape and it was released in December 2006 by Weird Truth Prod. which is Makoto’s own label releasing a lot of doom stuffs. In the end of 2007, Junpei left the band because he was too much busy for his own personal life. Soon after he was replaced by Yuichiro Azegami, who also play in grind band Brob. With this new lineup, we re-recorded 2 songs on demo and which was released as first CD EP in June 2008. And in June we organized German doom cult Worship’s shows in Tokyo. In July 2010, we toured in Japan with Australian doom Mournful Congregation. We played in 3 biggest city in Japan, Osaka, Nagoya and Tokyo. While we toured with Mournful Congregation, we had 2 guitar player. It was just a speccial lineup for that tour but we felt we need 2nd guitar player as permanent member. Then Mayo Odium from Stabat Mater(Jpn) was welcomed in January 2012. SKEPTICISM, one of the first funeral doom metal band ever existed. Quoting their biography: “Skepticism was originally formed in 1991. The first year of existence brought a few local gigs and the debut release – a 7” EP. The final line-up was reached in early 1993 and consists of a drummer, guitarist, organist and a singer. No changes in the line-up have taken place since then. The second release – ‘AEOTHER KAEAR’ promotional tape was released in late 1993. This release both stylistically set the course for Skepticism for the years to come and brought a recording contract with an US label Red Stream. In the reviews of ‘AEOTHE KAEAR’ Skepticism was also referred to as “Funeral Doom” for the first time. The debut album Stormcrowfleet was released in 1995. Three re-recorded songs from ‘AEOTHE KAEAR’ and three new ones are included. Stormcrowfleet is Skepticism at its purest – slow paced and extremely massive. The album got a mixed response – it was renowned as a classic by some and totally disappreciated by others. On the following releases – ‘ethere’ miniCD and ‘Lead and Aether’ CD Skepticism brought their sound even further. The simple and massive soundscapes of Stormcrowfleet had got a more sophisticated form with more aggression and dynamical changes. Again the response was mixed but this time the scene already knew what to expect. In 1998 Skepticism released the ‘aes’ – a half an hour composition. The minimalistic and holistic tendencies that had played a supporting part on the first two albums were now in a major role. ‘aes’ may sound slightly lighter than it’s predecessors but is still as Skepticism as ever. After the release of ‘aes’ Skepticism devoted to songwriting and not much was heard of the band for quite some time. The four-year silence ended in 2002 with the release of ‘The Process of Farmakon’ miniCD. The MiniCD features two re-arranged and re-recorded songs from the upcoming full length album ‘Farmakon.’ Like the two first albums ‘Farmakon’ will feature six songs and – according to the band – “be the most terrifying Skepticism album ever.” After some delays ‘Farmakon’ will be released in the summer of 2003. In addition to preparing the two new releases Skepticism re-entered the live venues for the first time in 8 years. This was also the first live show with the current line-up. The first gig happened in January 2001 at a club in Turku, Finland. Occasional live shows have happened after that prior to getting on the road for the Funeral Procession 2003 tour. During the year 2004 Skepticism played a few gigs in Finland. On our interview the latest news from the band! We really hope you’re goin to like this first show feeling there’s something more out there to look for. In our opinion there’s a whole scene out there which deserves support from who is interested in extreme music. The second part of “Of Nightmares And Darkness” will be out the next month!